EPG report big achievement: Ambassador Acharya - Integration Through Media ....! 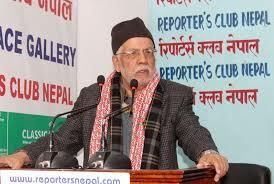 KATHMANDU: Nepali Ambassador to India Nilambar Acharya has commended that the report being prepared by the Eminent Persons’ Group (EPG) on Nepal-India relations is a huge achievement for bilateral relations between Nepal and India. EPA is a group of experts from both countries which has four members each from the both countries. The newly appointed envoy was of the opinion that it would depend upon the governments of the both countries how they would implement the suggestions once the report was prepared and submitted to the respective governments. On a query whether the EPG report would be left it lurch, Acharya replied that both countries should move ahead patiently and in good faith rather than in doubts. He also pointed out the need to promote tourism based on the goodwill to reduce the trade deficit.